Our Blog is archery talk at its finest...dedicated to informing and educating you in all things archery. 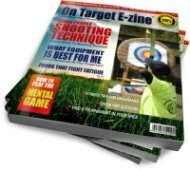 It delivers insight about topics such as technique, shooting form and shot execution that you might otherwise miss. It also allows you to focus on topics that matter the most. Already have an established club or team but you want to advance the skill level of your members? 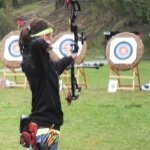 The Archery Blog delivers insights from instructors, coaches and leaders who will help you advance your personal training techniques and effectively transform your members into high performance athletes that get your team on the podium. How do you keep an archery program moving forward with limited resources? What is the secret to delivering a high quality program to the general public while serving the massive inflow of new archers? How can you increase the value of new program and reduce the cost? Is it possible to serve the needs of both high performance athletes AND entry level archery enthusiast at the same time? When you subscribe to our blog, using the RSS subscription buttons to the left, you will automatically be kept up to date with new additions to Learn-Archery.com as they happen, plus updates in the ever changing and highly competitive archery sports arena. If the RSS feed is not for you, don't miss out on the On Target E-zine. Do you have something to contribute to the Archery Community? Let's talk archery! Bring your thoughts and ideas to the round table and join regional and national experts as well as local coaches as they discuss the dramatic changes that affect the way we teach, learn and win in the exciting game of archery. Learn how best-in-class Coaches optimize their training schedule and increase their athlete's performance. Share your archery lessons, plans and training ideas and solutions or request more information from an expert. Subscribe to the Archery Blog today and stay ahead of the game and keep up with what's new in the rapidly changing world of Archery. Continue reading "More Photos Please!" Continue reading "Brilliant Beginner Guide"
I am not getting this. If I am, right hand dominant, but, have a dominant left eye, am I drawing the arrow back with my left or right hand? My height and my arm span are identical (5'10). Continue reading "Adult Woman With Average Strength For Compound Bows"
Continue reading "Muito obrigado ....Thank you from Brazil"
Continue reading "Cross Dominance Conundrum "
Continue reading "Hunting Recurve Bow Question"
Continue reading "Different Recurves Size Length"